Non concussive taps work by pushing down on the top of the tap to start the water flow for a specified length of time. 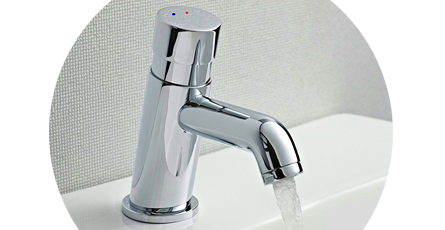 The top of the tap is self closing which means it slowly works its way back up to its original position and switches off the water flow once a set time limit is reached. Here you'll find a wide variety of stylish non concussive taps in a range of options. Discover mixer taps, pillar taps and standard non concussive basin taps perfect for commercial bathrooms and domestic settings. Our range of non concussive taps are built to withstand the stresses of commercial bathrooms. They're made of solid brass construction and are finished in chrome for easy cleaning. You'll find wall mounted taps and standard basin non concussive taps at the best prices.